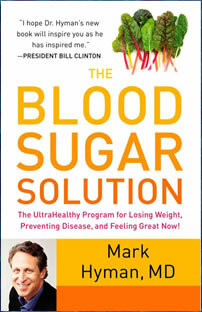 In The Blood Sugar Solution, Dr. Mark Hyman provides readers with a comprehensive six-week healthy lifestyle program to help everyone achieve their ideal weight, manage blood sugar disorders, prevent disease and maintain lifelong health. According to Dr. Hyman, the secret to overcoming obesity and preventing diabetes, heart disease, strokes, dementia and cancer is creating an optimal balance of our insulin levels. The first part of The Blood Sugar Solution goes into an explanation of the underlying causes of obesity and blood sugar disorders including diabetes. Hyman dispels seven myths about these conditions that may be preventing you from taking action. Readers are then provided with a Six-Week Action Plan to help put these strategies in place. Each week you will focus on a specific aspect of the program such as diet, nutritional supplements, exercise and stress management. A meal plan is provided for the entire six-week program along with shopping lists and a selection of recipes. Advice is also included to help you customize the program to suit your own unique needs. Hyman states that the foundation of The Blood Sugar Solution is good nutrition with a focus on high quality foods. You will avoid all sugars, flour products, processed food, gluten and dairy. The basic program can be followed by anyone to balance blood sugar, improve digestion, boost metabolism and alleviate stress. If you have been diagnosed with diabetes you will need to follow the advanced plan. You may also qualify for the advanced plan based on the results of your measurements and answers to a quiz. The advanced plan involves a more restrictive diet for six weeks with elimination of grains, starchy vegetables and fruit. You will also need to take extra nutritional supplements. Eggs, chicken, turkey, lamb, shrimp, salmon, tofu, lentils, black beans, chickpeas, wild rice, quinoa, walnuts, cashews, natural peanut butter, broccoli, cauliflower, spinach, lettuce, onion, avocado, tomato, red pepper, apple, pomegranate, goji berries, herbs and spices, olive oil, green tea, dark chocolate. The Blood Sugar Solution says that exercise is probably the most powerful medicine for treating diabetes and other diseases. A combination of aerobic conditioning and strength training has been demonstrated in scientific research to produce the greatest benefits for improving blood sugar imbalances and promoting weight loss. Ideally you should walk for at least thirty minutes every day but in many cases more vigorous and sustained exercise is necessary to produce results. Strength training is also important because it helps build muscle, which improves your energy metabolism. Encourages the intake of a wide variety of unprocessed foods. Provides a comprehensive plan for the management of blood sugar disorders. Includes a six-week blood sugar diet meal plan with recipes. Encourages creating a social support network, which is associated with a greater chance of positive outcomes. Can be adapted to suit vegetarian and vegan diets. Acknowledges the importance of stress management and adequate sleep. Requires the use of many different nutritional supplements, which will increase the cost of following the program. May be necessary for dieters to eliminate some of their favorite foods. Will probably require extra time for food preparation. The Blood Sugar Solution offers a holistic program to assist with the management of obesity, diabetes and related health conditions. Readers are provided with a detailed six-week blood sugar diet plan to quickly bring the body back into balance. However, this program can also be followed as a healthy lifestyle approach for the management of diabetes as well as for maintaining optimal health. Hyman, M. (2012). The Blood Sugar Solution: The Bestselling Programme for Preventing Diabetes, Losing Weight and Feeling Great. Hachette UK.